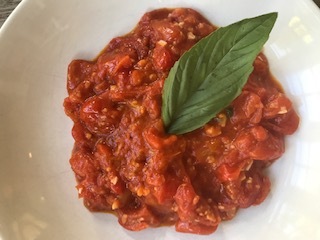 This sauce is quite simple and is made with fresh cherry or baby tomatoes- I like to mini San Marzano Plum tomatoes but buy what is the freshest or easiest. My favorite version of the recipe creates a lumpy sauce where the tomatoes keep much of their shape and texture. However, the recipe can be adapted with canned tomatoes, or in Italian “polpa”. If you like a sauce with a smoother texture, simmer for about an hour longer. When finished, take a hand blender or food processor and whiz into your desired consistency. 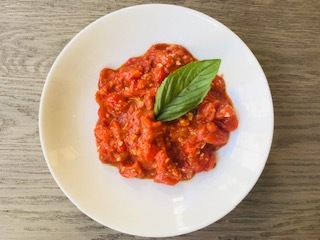 Fresh tomato sauce is a good friend to many dishes- any type or shape of pasta, varieties of white fish or chicken, or just poured over a vegetable, such as green beans or eggplant, for some added flavor…and a gorgeous burst of color. My grandmother made a tomato sauce that took several hours to cook. Her southern Italian recipe was rich, wonderful and highly time consuming. When my parents moved to Rome, my mother began to prepare this simple sauce that has become a family favorite. The fresher the tomatoes, and the more in season (summer) the better the final outcome. Growing up in an Italian family assured that at least once a week there was a simmering pot of tomato sauce on the stove top. When my mother was not looking, we used to love to take bread and dip it into the cooking sauce. My mother also has fond childhood memories of her grandmother buttering a piece of fresh bread, scooping a bit of the bubbling tomato sauce onto it, and giving it to her when no one was looking. Note: Italians estimate about 100 grams (about 4 ounces per person- 1 pound box serves 4 people. But if serving as a starter, you may want to the portion size to be slightly smaller. I often measure out the pasta (since shapes differ) onto the plate that will be used to “guess-timate” the right amount. You also need to consider the heartiness of the sauce and determine if more or less should be served- lighter the sauce more pasta, heavier a little less. 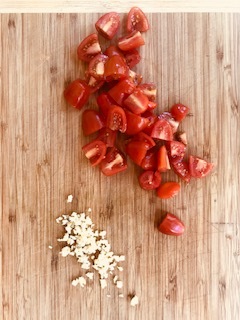 Cut the tomatoes into halves (if cherry), or small pieces about 1/2 inch in size (12mm), and finely mince the garlic. Cover bottom of a medium sauce pan with olive oil and place over medium heat, add the tomatoes. When tomatoes begin to soften in 3-4 minutes, add the garlic, basil leaves and salt. Lower the heat and simmer for at least 45 minutes or up to an hour. For extra flavor, and my mother and grandmother's trick, finish off with a tablespoon of butter right before serving.